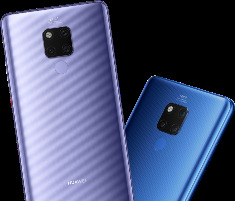 The Huawei Mate 20 X is another variant of the Chinese OEM's late-2018 flagship device. Like the Mate 20 and 20 Pro, it runs the Kirin 980 chipset and rocks the Leica-branded triple camera. However, it pushes even the definition of 'phablet' with a 7.2-inch screen. Huawei finished off their latest flagship release event with the introduction of a new member of the Mate family: the 20 X. This new phone has many of the same features as the Mate 20 Pro and Mate 20, but has some all to itself. The most prominent example of these is the 7.2-inch screen, which pushes the Mate 20 X into tablet territory. This screen is an OLED panel with DCI-P3 support. Like the Mate 20, it has a dew-drop notch to exploit all that display with a high screen-to-body ratio. On the other hand, it has a 2244 x 1080 resolution, which would make it pale in comparison to the 3120 x 1440 6.3-inch screen found on the Mate 20 Pro in terms of pixel density. Huawei has made it very clear that the Mate 20 X is meant for gaming. It is powered by the 7nm Kirin 980 processor, and also has a feature called GPU Turbo 2.0. Gripping the device while gaming has also been considered: the OEM has developed a unique texture for the Mate 20 X that is intended to help keep a hold of the huge device while giving a vaguely glittery finish. On the other hand, Huawei may also be coming for the Galaxy Note line with this phone. It also supports the use of the new M Pen, although there is no silo or holder within the Mate 20 X for this optional-purchase device. The Mate 20 X also comes with 6GB of RAM, 128GB of internal storage, Android Pie (9.0) out of the box and two colors: Midnight Blue or Twilight Silver. Currently, there are no indications as to its price; however, given the rumors concerning the rest of the premium Mate 20 line, it may not be cheap.